Central Heating Kitchen Plinth Heater. 500 plinth heater is a high quality heating solution for your kitchen. Using the space under the cupboards instead of taking up precious wall area, it frees up more space to maximize your kitchen work area. Connecting directly to the central heating system and fitting tidily in the plinth space under a unit or cupboard, heat is blown through a heat exchanger into the room by a low noise 2 speed fan. The fan convector automatically switches on and off with the central heating system and because it runs off the central heating system, it is much cheaper to run than electric only heaters. Also there are no worries about the build-up of dust that causes overheating in electric heaters. And the constant cleaning they require. There is no need to switch this unit on and off manually. If you need more heat all you do is switch the fan to boost which will push more hot air into the room. There is also a manual override switch which allows you to switch the fan off if you do not require it. Fan heaters are up to 24% more efficient than standard radiators. White, stainless steel and Brown Grills. 2 x 700mm long 15mm flexible hoses with isolating valves. Normal 896 Watt (3057BTU) Boost 1166 Watt (3979 BTU). Max working pressure 10bar (1MPa). Dimensions: Width 320mm, Height 100mm, Depth 310mm. Electrical supply 220-240V - 50Hz. Noise level tests in accordance with EN23741. Level floor area is required under the cupboard base. Other Items People Looked At. Electric 500x800 chrome towel rail Electric 500x720 stainless steel towel rail. Codes AB, IV, HS, KA27-28, KW, PA20-49, PA60-78, PH17-26, PH30-44, PH49-50, ZE, Northern Ireland, BT. Deliveries to These post codes. You will have to pay before we can resend the items. We strongly advises you not to book your installers or engage in any preparatory work until full receipt of your goods. Our carriers can contact you. As soon as we have delivered the goods to your door you will be responsible for them. We will only deliver to the address on the order and goods will not be left without a signature. Please ensure you check all goods at the point of receipt before signing for them for any damage. Any claim of damages after the package. If you find the product damaged when the carrier is trying to deliver. Inform us immediately and we. Will arrange a replacement for. Any goods that has packaging damaged, or has been installed, or is. If you wish to return an. Or the cost of returning the item. Strongly suggest you return the item using. A trackable and insured means. The order out to you it. Arrives damaged or is incorrect then we will replace it for you free of charge. The item "Kitchen Plinth Heater Central Heating Plinth Heater Kickspace Space Saver" is in sale since Wednesday, March 04, 2015. This item is in the category "Home, Furniture & DIY\Heating, Cooling & Air\Radiators". 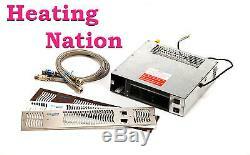 The seller is "heatingnation1" and is located in North Yorkshire. This item can be shipped to United Kingdom.